Pereira Walter Lawyers LLP is a Mississauga based law firm specializing in personal injury law. Carlos Pereira and Michael Walter are experienced lawyers who have each been practicing for more than 16 years, Michael in the areas of Personal Injury, Insurance and Employment and Carlos in the areas of Personal Injury and Real Estate. In January 2010, Carlos and Michael combined their practices, their staff and their more than 30 years of collective experience to create a Mississauga based law firm dedicated to providing individuals and their families with exceptional results and personal service in the areas of Personal Injury, Employment and Real Estate. Together, they have built a high quality team of professionals focused on the needs of individual clients. 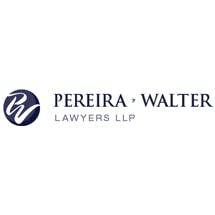 Pereira Walter Lawyers advocate for the legal needs of each and every client and their families to ensure they receive fair treatment from insurance companies, employers or other litigants and will use all available means to achieve results for them. Check out the testimonials page to see what our clients are already saying about our new firm and get our experience working for you!